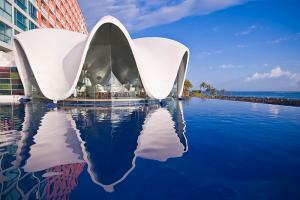 This gracious and thoughtfully planned 231-room beachfront property features retro urban design. The resort's multi-level infinity-edge pool features waterfalls, fountains, a Jacuzzi®, pool-deck cabanas and landscaped decks, as well as a fully equipped oceanfront fitness center. By day the lobby is a bright, welcoming sanctuary. But when the sun sets, the boundaries disappear and the indoors and outdoors blend seamlessly. The lobby bar invites guests to mingle freely in cosmopolitan style and elegance.